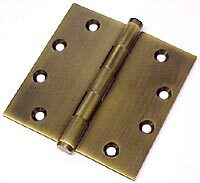 This hinge is a work of art and is of the finest quality available today, just holding it in your hand makes you fully appreciate the weight and quality. This full mortise hinge is extruded for extra strength and precision. Fitted with a high grade, removable, rust-resistant, stainless steel pin. Supplied with matching solid brass flathead screws and standard removable button tip finials designed to thread into the top & bottom of the hinge barrel. Deltana decorative finials are available in matching finishes. Note: This product is also known as DSB455, DEL-85023 on other websites. Made of .134in. thick solid brass. Please call or use our Online form to receive an RGA (Return Goods Authorization) number within 30 days of purchase prior to returning merchandise, returns WILL NOT be accepted without one. Fifteen percent (15%) restocking fee applies to all returns. Defective products will be replaced.